Galactic core outbursts are the most energetic phenomenon taking place in the universe. During the early 60’s astronomers began to realize that the massive object that forms the core of a spiral or giant elliptical galaxy periodically becomes active spewing out a fierce barrage of cosmic rays with a total energy output equal to hundreds of thousands of supernova explosions(1, 2). The cosmic ray electron component of such an outburst is always accompanied by synchroton emission which consists of electromagnetic radiation ranging from radio wave frequencies on up to X ray and gamma ray frequencies. A survey has shown that roughly 15% – 20% of all spiral galaxies are currently seen in their active core explosion phase during which they exhibit Seyfert-like characteristics. 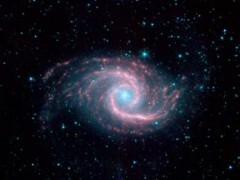 One example is Seyfert galaxy NGC 1566 (Figure 1). In some galaxies these active emissions have been observed to equal the energy from billions of supernova explosions. The galaxies undergoing these more intense outbursts are sometimes designated as quasars. Their core emission being so strong as to greatly exceed the stellar emission from the galaxy’s disc, causing the galaxy to have a star-like or quasi-stellar appearance. One example is the spiral galaxy PG 0052+251 (Figure 2) whose active, quasar-like core is radiating 7 times as much energy as comes from all of the galaxy’s stars. Figure 2. 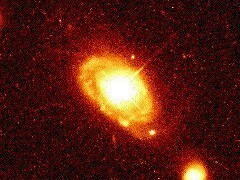 Image showing the luminous quasar-like core of spiral galaxy PG 0052+25. Taken with the Hubble Space Telescope. 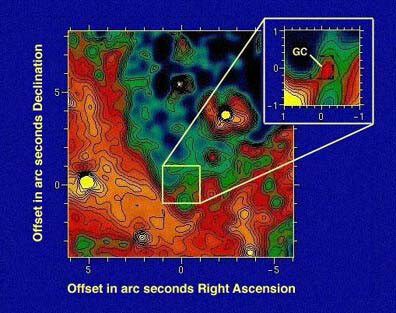 During the 70’s astronomers realized that the core of our own Galaxy (the Milky Way) has also had a history of recurrent outbursts, that at periodic intervals it enters an active phase in which its rate of cosmic ray emission rises many orders of magnitude. (3) Sometimes designated as Sagittarius A*, the core is estimated to be about 4 million times as massive as our sun; see Figures 3 and 4. But some of the larger more mature galaxies can have core bodies that range up to billions of times the mass of our Sun. Conventional astronomy refers to these as “black holes,” visualizing all of the galactic core’s mass to be concentrated at a single dimensionless geometrical point. However, evidence suggests that galactic core mass does not exist in the form of a point singularity, but as a very dense supermassive star having a density similar to a neutron star or hyperon star. In the cosmology of subquantum kinetics, these non-singularity core masses are termed mother stars (see link for more information). Paul LaViolette, who is currently president and chief researcher of the Starburst Foundation, was the first to demonstrate that cosmic rays radiated from the active core of an exploding galaxy can penetrate far outside the galaxy’s nucleus to bombard solar systems like our own residing in its peripheral spiral arm disk. He coined the word “galactic superwave” to refer to such a cosmic barrage. Galactic superwaves are a recent discovery. Until recently, astronomers believed galactic cores erupted very infrequently, every 10 to 100 million years. (1) They also believed that interstellar magnetic fields in the Galactic nucleus would trap the emitted particles in spiral orbits causing them to reach the Earth very slowly. (4) For these reasons, most astronomers did not believe that core explosions in the Milky Way posed any immediate threat to the Earth. • Galactic core explosions actually occur about every 13,000 – 26,000 years for major outbursts and more frequently for lesser events. • The emitted cosmic rays escape from the core virtually unimpeded. As they travel radially outward through the Galaxy, they form a spherical shell that advances at very close to the speed of light. Disclaimer: The synopsis of the superwave theory presented here should not be regarded as a complete presentation of this theory for the purpose of scientific debate on the internet. Those interested in a rigorous presentation of the theory and its supporting evidence should consult the update of Paul LaViolette’s Ph.D. dissertation (available in CDROM format) and his various papers some of which are available for download at this website. His book Earth Under Fire is also a good resource but is written for a general audience and is not intended as the primary reference to rely on for scientific debate.